← Love Art is Back! I temporarily shook off the social cobwebs our society refers to as “motherhood” last night, and made my way to the “Art after Dark” party at Love Art. Word has really gotten around about this show, and the house was packed full of revelers who were apparently as interested in their artfully dressed peers; the free flowing whisky and craft beer; and pumping dj beats, as the variety of works on display. The show is much smaller than a fair like Art Toronto, which gives the visitor the freedom to socialize and make the rounds at a very leisurely pace. The quality of the creative offerings also varies widely offering even the amateur a nice opportunity to practice the art of the critique. Here are a few of my favourites from the show. The felted wool wall-hangings by Mexican artist Paloma Torres is an interesting example of an artist pushing the boundaries of her medium. The piece above is based on photos taken by the artist from subway excavations in Mexico City. 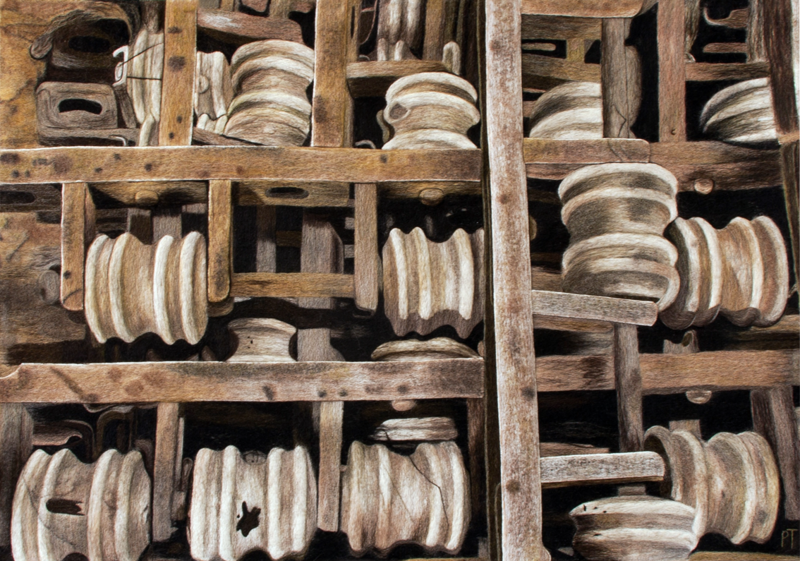 Coincidentally, this piece is another example of a Mexican artist pushing the boundaries of a traditional technique. 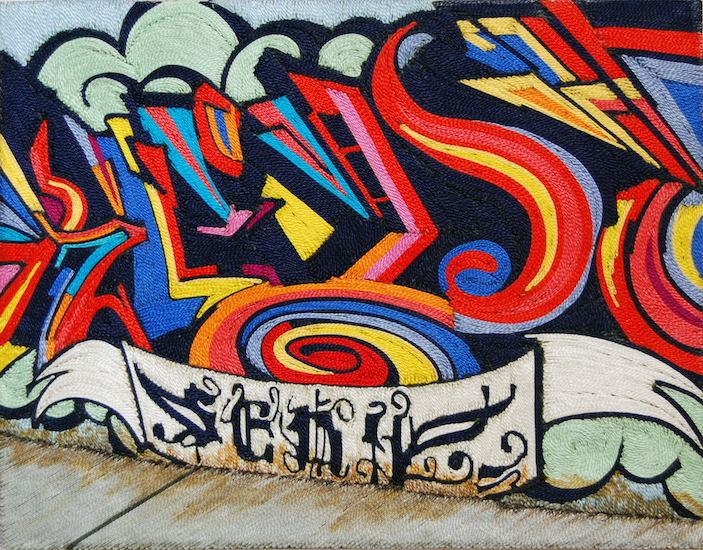 Working from photos of urban graffiti, Ortiz-Vega translates her images into yarn paintings. The technique consists of priming a board with beeswax, then poking embroidery floss into the wax to construct the image, thread by thread. Her pieces were on display at Toronto’s own Parts Gallery booth. 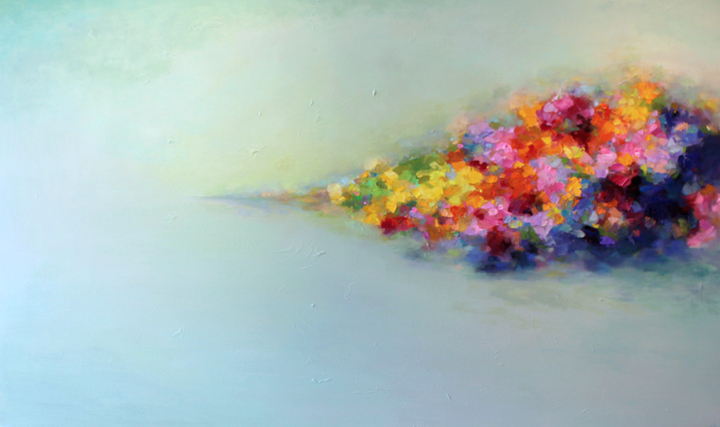 Yangyang Pan’s abstract oil was another highlight from the typically quality offerings at Parts Gallery. You may remember the stunning “whale” works I wrote about last year shown at this booth, by Douglas Walker. The show continues to run today and tomorrow. Click here for complimentary general admission tickets.